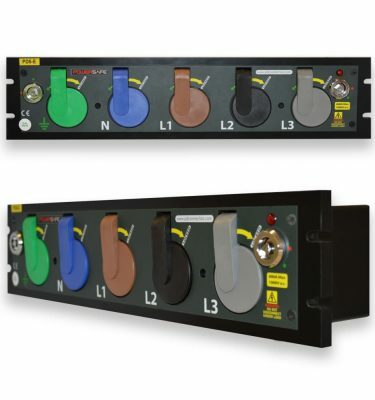 The Powersafe Power Distribution Box is an electrical connection point for single pole connectors on three phase electric power up to 800 amps. The Powersafe Box has a sequential mating locking system to ensure safety circuits are connected first and disconnected last (FMLB). Furthermore, the keyed design eliminates the possibility of electrical connection errors. The powerlock box accepts connection of Powersafe power connectors and is compatible with other manufacturers. The Powersafe powerlock box is a 1P heavy duty electrical device that is suitable for low voltage power distribution. Available with either 5 ports or 4 ports (no neutral). Alternatively, ask us about a Dummy Plug to turn a 5 port box into a 4 port box temporarily. The Powersafe box can be panel-mounted, providing the most cost-effective solution, or brought out to an external or safe position. 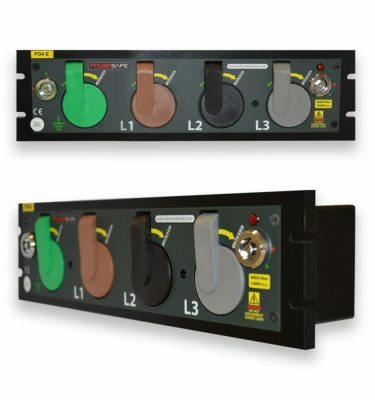 Large power connections can be catered for by stacking the units allowing for even the largest of low-voltage supplies to be connected in a safe way. The box utilises standard Powersafe Connectors in either drain or source. The power distribution box has mechanically keyed ports to ensure correct phase connection, the ports are lockable to prevent accidental disconnects and colour coded to suit international wiring colour standards. Connections are safe: Earth and Neutral connections must be connected first and Live Lines 1 to 3 cannot be mated in the wrong order due to the innovative sequential mating mechanism. The distribution box is also IP67 rated when mated, allowing a waterproof connection. A special locking key is required to plug or unplug all connectors so only authorised persons in possession of the key can connect and disconnect the Powersafe Box. Insulated: Some electrical regulations required hardware to be made of non-conducting materials. The Powersafe Box is insulated, giving greater freedom in fastener specification. The materials used are heavy duty, flame retardant thermoplastics. Harsh Environment Application: We can supply an optional lid as a protective cover that is built in and forms part of the mating sequence giving IP65 protection to the un-mated box. When the connectors are installed the box is rated IP67. This product is compatible with VEAM Powerlock box connectors.